By bringing your baby to an infant aquatics class your baby will learn to develop their natural instincts in the water as well as have fun! We aim to facilitate and encourage their journey as they explore the world of water and learn how it’s so different and unrestricted from being on land. Water allows more freedom of movement and they experience so many different sensations as it stimulates all of the senses. You are in the water with your baby the whole time learning together. If you are not a swimmer, or are a weak swimmer, don’t be put off as the water is always shallow enough for you to stand up in. The teacher is always on hand to offer advice and support. Lessons are planned to gently introduce you and your little one to the water and gradually increase confidence, experience and understanding. We plan our lessons to suit the class needs and provide structured, stimulating activities and give you both time and space to experience this together. 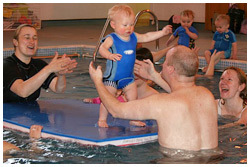 Initially we will teach you techniques on supporting and moving with your baby in the water. This will give you a firm grounding to be able to swim with your baby. 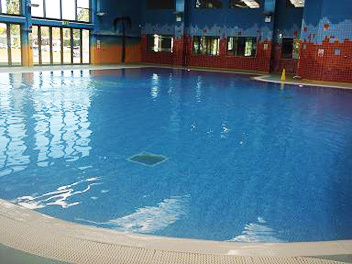 With subsequent courses and baby’s ongoing development we progress further with the basic techniques and moves to encourage you both to swim confidently together. Lessons are based on fun and learning whilst being safe. The typical lesson may include songs or rhymes, toys, and diving to encourage interaction with baby to develop all of their senses. Safety has a strong focus in our teaching methods and your baby will be taught vital life saving techniques, within a safe environment. You might think it strange to take your young baby to swimming classes already but all babies are born with natural swimming reflexes. Drowning is one of the largest causes of accidental death for children in the UK. Statistics have shown that many babies that drown do so in very shallow water. We develop baby’s natural instincts and teach babies to be safe: by learning to reach and hold onto you, the pool side, or floats. To jump in and kick up to the surface; and to turn to the side. All this in a fun and safe environment that doesn’t feel like learning, which helps everyone to feel relaxed. 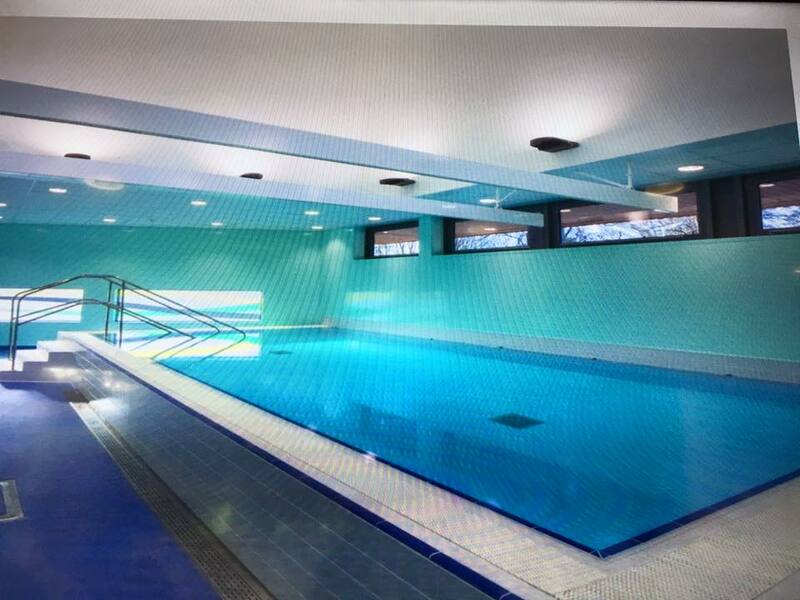 Swimming from an early age is very beneficial to natural development and co-ordination. It allows baby to move more freely than on land, feeling their own balance and buoyancy in the water. This can be both empowering and exhilarating for them to move on their own. 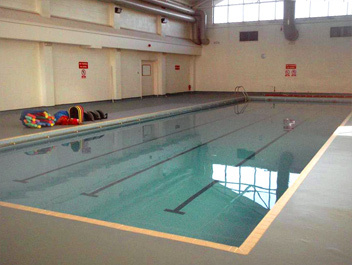 A good swimming class involves fun and laughter whilst learning vital skills. Babies and young children learn through play as well as practice. Swimming with your baby encourages your baby to develop a lifelong love and respect for water. It also gives you confidence with your baby in and around water. It’s the perfect bonding time together, not to mention all the other benefits. In the first few years of babies lives their development is amazing. Their brains grow faster now, than at any other time. Regular swimming helps strengthen the brain and cement their learning, it’s not only fun, it’s a form of exercise for both their body and brain. This freedom of movement allows them more participation before they can even crawl or walk. The earlier your baby starts to be comfortable in water the easier it is for them to relax; as they have had no time to develop any fears, they can start their learning with positive experiences. We offer classes to babies and children of all ages, it’s never too late to start. Just email us (denise@activebabycompany.co.uk) or call and leave us a message 01604 826066 with your child’s date of birth and we can recommend a suitable class. 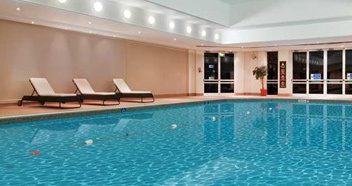 Classes take place at Billing Aquadrome, Hilton Collingtree, Daventry Hill School, and Gateway School, Tiffield.